Nurturing the seed of the specifically human capacity. 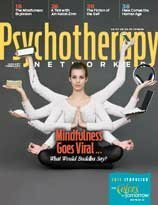 By replacing the exotic aura of spirituality with the language of science and a down-to-earth self-help approach, mindfulness has brought practices once considered New Age hokum into mainstream acceptance. But as it increasingly becomes a product to be sold in the marketplace, does it risk losing something vital to its transformative power? Since he first developed Mindfulness-Based Stress Reduction in 1979, Jon Kabat-Zinn has not only become a key figure in shaping our ideas about physical and mental health, but a cultural icon. Here he talks about handling his public role and being placed on a pedestal. For the first time in history, we’re mainly experiencing nature through intermediary technology that paradoxically provides more detail while flattening our sensory experience. Can becoming entranced by electronic media alter our brains? The mental health professions are now being forced to address the debate over marijuana legalization. Clients with ADHD often know the coping skills that can improve their lives—the problem is applying them in daily life. The case of a young man hearing voices shows how even problems that first appear to be extreme can be resolved by empowering clients to alter subtle aspects of their internal experience. Esther Perel, a couples therapist whose TED talk has had more than 5 million views, believes that it’s time to challenge the mismatch between the romantic ideal and the changing realities of contemporary life. Why did a seeming rags-to-riches story of a young man’s triumph over poverty and the lure of the streets end so tragically?